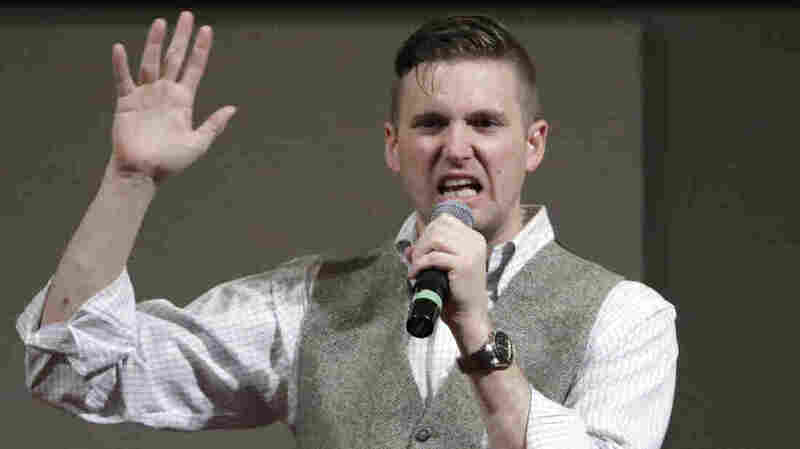 White Nationalist Richard Spencer's Speech At Auburn Sparks Protests, Arrests : The Two-Way Spencer, a leader in the alt-right movement, addressed a crowd at Auburn University on Tuesday. The school had barred him from speaking, but a federal judge cleared the way on First Amendment grounds. 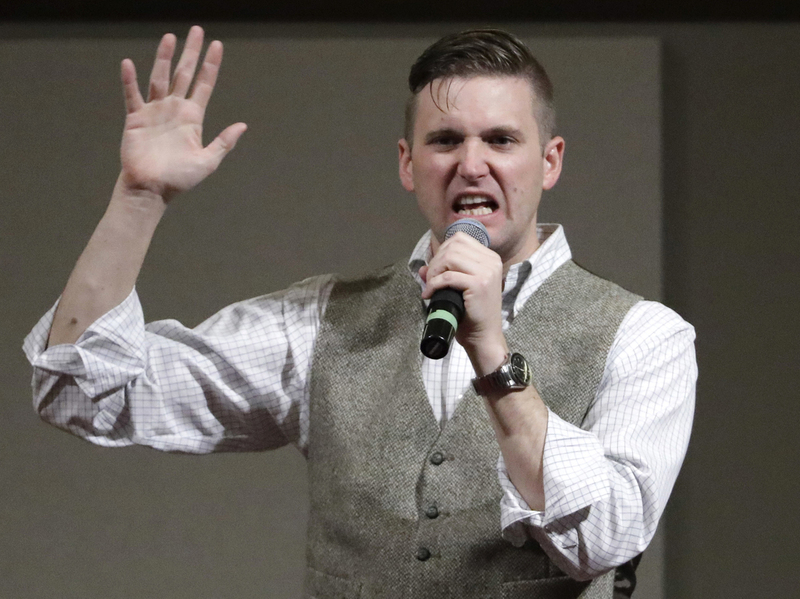 Richard Spencer, a white nationalist who claims to have coined the term "alt-right," speaks at Texas A&M in College Station, Texas, in Dec. 6, 2016. White nationalist Richard Spencer's speech at Alabama's Auburn University was preceded by controversy and punctuated Tuesday night by protests, arrests and some violence. Hundreds of people, some chanting and carrying signs, demonstrated outside Auburn's Foy Hall on Tuesday. City of Auburn police Capt. Lorenza Dorsey told NPR that three people were arrested on disorderly conduct charges. Video posted by AL.com shows one man lying bloodied on the ground before being led away handcuffed by police. Auburn University itself was caught off guard by the controversial event. "Spencer had rented the meeting hall through a third party and had surprised both Auburn faculty and students last week when he announced via Twitter that he would be coming to campus to speak," Troy Public Radio's Kyle Gassiott reports. The school initially barred Spencer from speaking, citing safety concerns. But on Tuesday, a federal judge reversed the school's decision on First Amendment grounds, clearing the way for Spencer's speech. In a letter, posted to Auburn's web site, the university's provost and chief diversity officer asked students to respond peacefully to the event and said it was OK to miss classes Tuesday night. "Auburn University has faced attempts by uninvited, unaffiliated, off-campus groups and individuals to provoke conflict," the letter stated, adding, "We will not allow the efforts of individuals or groups to undermine Auburn's core values of inclusion and diversity,"
Spencer is president of the National Policy Institute, a think tank that proclaims to be "dedicated to the heritage, identity, and future of people of European descent in the United States, and around the world." Those views were on display when he addressed a sometimes raucous crowd in the 400-seat auditorium that was filled to near capacity Tuesday. Spencer greeted them by saying, "We won a victory, certainly for the alt-right." The "alt-right" is a movement associated with racism, anti-Semitism and misogyny that once existed mainly on the Internet. Spencer claims to have coined the term. Colleges across the country from the University California, Berkeley, to Texas A&M have been trying to balance free speech and security when controversial speakers appear on campus.